These seasoned New York purveyors of authentic American ‘roots’ music play a delightful spicy musical gumbo of New Orleans fare influenced by the Dirty Dozen, Rebirth, and New Birth brass bands. If you find that your musical and cultural diet has felt a little bland lately and been wondering where you might spice it up, well search no more—you won’t want to miss the master musical chefs of the Jambalaya Brass Band! These seasoned New York purveyors of authentic American ‘roots’ music play a delightful spicy musical gumbo of New Orleans fare from the likes of Buddy Bolden, Jelly Roll Morton and Louis Armstrong straight through to the heights of their own modern sounds which incorporate elements of R&B, Gospel, Funk, Zydeco, Latin, Hip-Hop and Be-bop. This tight and tasty ensemble is the ultimate in New Orleans party bands which is amply demonstrated in their new CD release It’s a Jungle Out There. 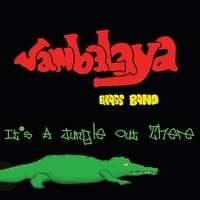 The Jambalaya Brass Band is a group of seasoned musical pros from a variety of impressive previous musical settings as diverse as the Duke Ellington Orchestra to the Lounge Lizards,* yet they have a knack for integrating these disparate musical experiences into one dynamic setting. They embody the history of the best American music of the last hundred years while at the same time suggesting a prescient trajectory of America’s musical future. Some of the Band’s arrangements are traditional, and many are original and innovative while the playing is precise and spontaneous at the same time, yet all is conceived with imagination and wit. Because after-all, let’s face it, this is New Orleans party music and, if anything, the Jambalaya Brass Band is a joyous and exuberant musical celebration as they have proven on many occasions. From the Warner Bros. film Where the Wild Things Are, to the Britney Spears Super Bowl Party in New York City at Planet Hollywood, to the half-time Mardi Gras show for the New York Knicks at Madison Square Garden this group of talented musical revelers has literally made the party. Jambalaya’s foundation is provided by Chauncey Yearwood’s bass drum and cymbal; Washington Duke’s snare drum and cymbal; and Ron Caswell’s tuba—and this rhythm section cooks with a flavor as driving as it is subtle! Adding the spice on top is the trombone, vocals and percussion of Curtis Fowlkes; the trumpet, vocals and percussion of Walt Szymanski; and the tenor sax, vocals, percussion of leader and founder Ric Frank, who has worked with the Ellington Orchestra. In addition, the group is commercially flexible and viable in that they can provide a unit of five to nine players in a live setting—and what accomplished players these guys are! It’s a Jungle Out There is a rollicking musical journey and a great celebration of American music while at the same time an appetizing preview of what this group is capable of live. Putting on It’s a Jungle Out There at a party is a sure bet, but seeing these talented players live really brings the party directly home to you.